Daniel Chester French's sculpture of "Europe" shows both its ancient history, noble past and colonial conquests. 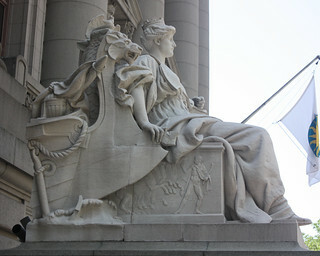 "Europe" strikes a noble pose, her left hand supported by a globe signifying the colonial conquests of many European countries. The left side view shows "Europe" seated on a throne decorated with a frieze from the Parthenon in Athens, representing the history of ancient Greece. "Europe's" right hand is resting on the bow of a ship with a lion's head, symbolizing the conquests of Europe during the age of discovery. The right side view of "Europe" shows more of the Parthenon frieze on the throne. The shrouded figure behind the throne represents "Ancient History" which is reading a scroll and holding a skull crowned with a laurel wreath.